The Forest Glen Homeowners Association (HOA) exists to serve the needs of its members and help our community retain the standards envisioned when the covenants were written. Officers are elected each year by the membership and serve without pay. We encourage all members to review the covenants, actively participate with the upkeep of our neighborhood, and contact board members with any questions or concerns. Dues for 2016-2017 are $121. Our neighborhood is part of the Richland One School District, and is zoned for Satchel Ford and Brockman Elementary Schools, Crayton Middle School, and A. C. Flora High School. Garbage and recycling pickup occurs every Friday. See the Forest Acres Garbage, Recycling & Yard Debris page for more information. Our polling place is Sanders Middle School. Residents can join the Forest Glen facebook group! Please visit the Architechtural Review page of this site for more information on the process of requesting a review. If you’re not sure whether or not your project needs approval, contact us! 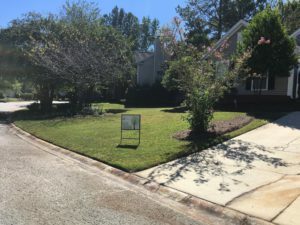 Congratulations to 208 Glenbrooke Circle, the September Yard-of-the-Month winner!